There are some fabric lines that have your heart from the moment you meet. Both of Carolyn Friedlander's collections -- Architextures and now Botanics -- have affected me that way. These prints are so incredibly elegant in their simplicity. The sketched illustrations, the uniquely modern designs, the carefully curated colors all grab my attention and simply will not let go. A charm pack of Botanics arrived in the mail yesterday afternoon, and I couldn't wait. As soon as I finished dinner, I pulled out my Architexture scraps and some Kona solids, opened up the Botanics stack, and made myself a new desk mat using the simplest of patchwork layouts. The mat is backed in a Lily Belle print by Bari J, and I quilted it in a dark gold Aurifil thread which I absolutely love. It's a nice compliment to the little touches of gold that show up in a few of the prints. 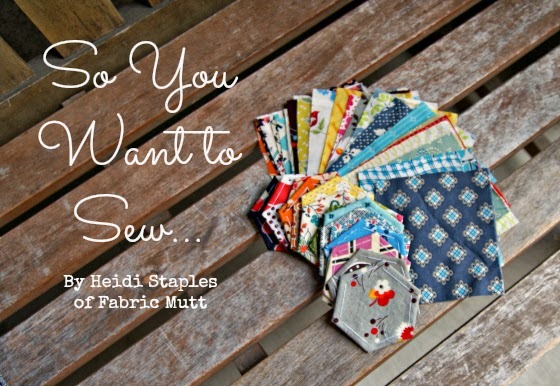 With that comedy of errors behind us, let's talk about sewing. I don't think I've ever gotten so much out of a fat quarter bundle as I did out of my stack of Fort Firefly: a baby quilt, an organizer, and now a set of activity pouches which I made for our church. Our Director of Christian Education plans to stuff these with all kinds of goodies that little ones can play with during the service. Again, I love that this fabric is pretty gender neutral. Though there are definitely a few girly prints, most of the colors and designs work well for both boys and girls. Cotton webbing has become my new best friend. It cuts down on sewing time since I don't have to make my own straps, and it makes a project look just a little more finished at the same time. Believe it or not, I still have some Fort Firefly scraps left, but I'm setting them aside for some quiet hand sewing over the next few days while my body recuperates. Of course, the real lesson here is to spend less time in the kitchen and more time at my sewing machine...right? So here's the thing...I've been walking the most painful of lines lately with some big news that I wasn't able to share with you yet. 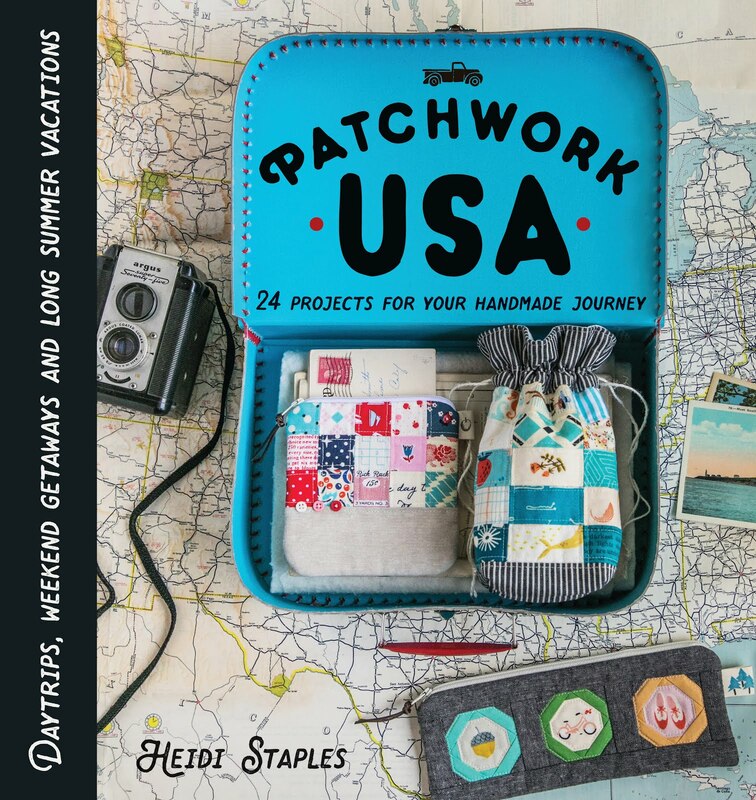 However, after a little conversation and some great clarification from my editor, I am thrilled to tell you that I'm in the process of writing a book for Stash Books! I debated long and hard over when to share this news with you. Writing and publishing a book is a really long process (we're looking at a publication date of spring 2015 for my title), and not only am I not allowed to share any of the juicy details with you for quite a while but I also don't want you to be sick to death of the whole thing by the time the book actually hits the shelves. On the other hand, it kills me that I've been writing and sewing like mad from morning till night each day and yet can share almost none of it with you here at Fabric Mutt. 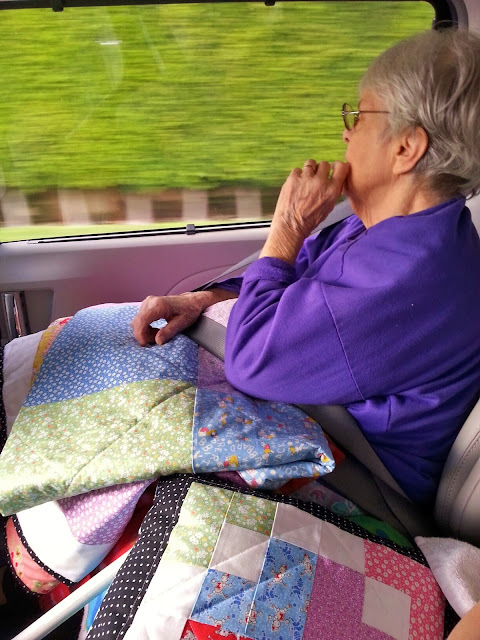 I didn't want you to think that I'd lost interest in sewing or was letting the blog slowly waste away to nothing. So please know that though I won't be posting more often than once or twice a week and though I can't spend nearly as much time as I'd like reading all of your blogs and leaving comments as I go, it isn't because I don't want to. I'll be back to my regular routine in a few months, promise! Can I also just take a moment to say that the people at C&T Publishing and Stash Books are fabulous? They have a fantastic introductory pack for new authors which is so helpful, and just look at the incredible box of goodies they sent me above. For someone who's walking into the great unknown here, it's so wonderful to be surrounded by encouraging people who know exactly what they're doing. Bunny raced off to her desk and wrote this note for me on the day I found out that my book proposal was accepted. And my dear sweet family...no one is giving up more than these people to make this project happen. They are so proud of my amazing opportunity and so patient with me as I constantly swing between excited and absentminded and completely overwhelmed. I absolutely could not do this without them. So that's the scoop, my friends. I can hardly wait to share this book with you when it's done, but for now I promise not to bore you to pieces with constant chatter about it. Just know that I'm still here and still honored to have the chance to be a tiny part of your lives. It's been an exhausting week here at our home. My daughters have been fighting a nasty bug that comes with endless high fevers, and it's been a constant battle to keep their temperatures below 101 degrees. Blogging and blog reading naturally fell by the wayside for the past few days, so I missed the posting of my latest piece for The Glamorous Housewife blog. I promised you all a tutorial for that organizer I showed you last week. Here it is: the Constance Organizer. This version is slightly different from last week's. It has an extra pocket on the left side of the interior, a flap closure, and a much simpler exterior. The basic pattern is no problem to customize, though, so you can easily change this to make it whatever you want. That's the beauty of patterns for me -- I love to play with the details and make something new. These make great last minute gifts for those of you who are already casting an eye toward Christmas presents. If you make one of these, please do send me pictures or mark a photo with #fabricmutt on instagram. I'd love to see what you're making! 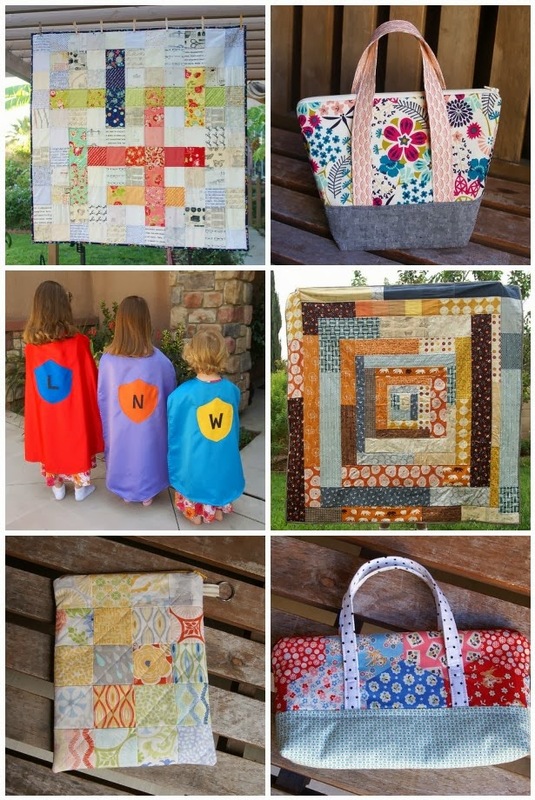 I'm sticking to my goal of sewing at least one project each month with my three girls. This month we made little stuffed dachshunds, a fun project that came together pretty quickly. The only part of this project that's actually stuffed is the body -- everything else is nice and floppy. As always, I let the girls pick out their own fabric. Rather than letting them dive into my cupboards, it's easier for me to ask them what color they want their project to be and then give them a matching selection of fabrics to look through until they come up with what they like best. We tried three different methods for attaching the ears, and the third time was definitely the charm as you can see on the far right. I figure it doesn't hurt for the girls to experience the joys of problem solving at a young age. A friend of mine was having a lousy day last week. I couldn't be there to sit down for a cup of tea and a chat, so it seemed like a good idea to send a little care package. My leftover pieces of Fort Firefly and Charlie Harper came in handy as I sewed up a fun organizer for her to use. I still can't decide which I love best -- the front or the back. These prints are all so adorable. Linking up (better late than never) to Finish It Up Friday. Not since Briar Rose have I been so excited about a fabric collection for children. 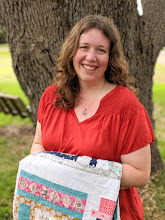 Fort Firefly by Teagan White is utterly charming, and I was thrilled to death when the wonderful people at Birch Fabrics sent me a bundle to play with. A friend of mine is expecting a baby by the end of this month, and since we don't know yet if it's a boy or girl, I was looking for fabric that would walk the fine line of gender neutrality. I'll admit that this probably leans a little more toward the girly side, but it's cute enough that I think it can be excused. I've been dying to make the Books for Baby quilt from Patchwork, Please! since I first saw it. This is a slightly smaller version -- nine blocks instead of sixteen -- but it's still large enough for a small baby quilt. Fort Firefly is a fussy cutter's dream. Every print is full of adorable details, and I had a hard time narrowing my choices down to these nine covers. I pulled from my scrap bucket to find text and map prints that would work for the pages and brown fabrics for the book bindings. Each quilt block is edged with Quilter's Linen, which I'm absolutely loving right now. The backing is a quiet dot print from Vintage Modern by Bonnie and Camille. 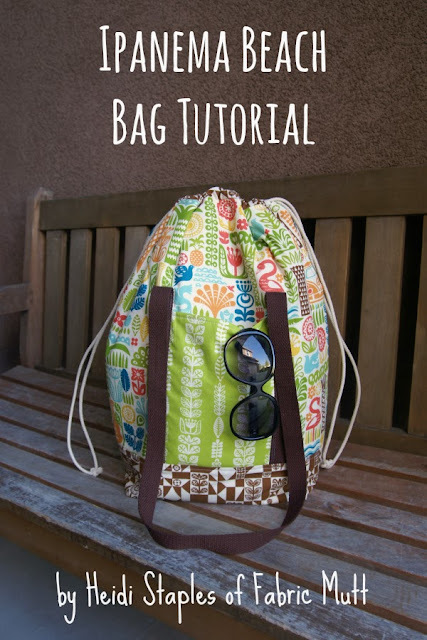 I thought it would be fun to make a little bag to hold the quilt instead of wrapping it up in paper, so I did a larger variation on my party bag tutorial using leftover prints from the Fort Firefly bundle and some white webbing that I had on hand. I couldn't resist sewing up a little cloth tag to decorate the front using some extra patchwork squares and a piece of cord. I love the way this bag turned out. It's just the right size for the folded quilt and will also fit nicely into a diaper bag for emergency situations once the baby's here. 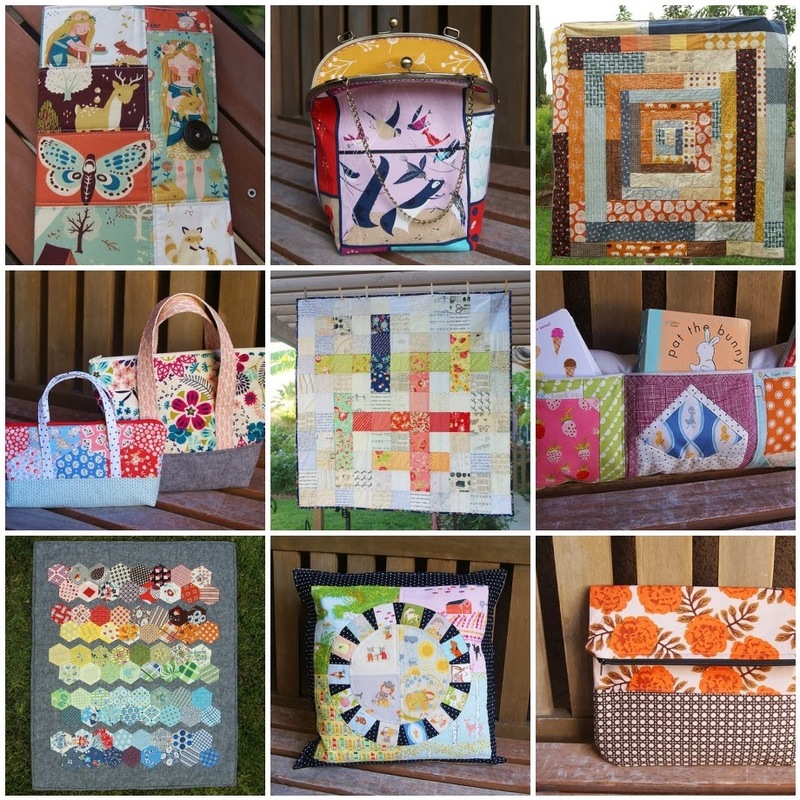 There are so many wonderful sewing projects out there, but I still think that baby quilts are some of the sweetest. Yes, I'm aware that most of you already do know how to sew. For those of you who don't, however, or who might have a friend who's looking to get started, head on over to The Glamorous Housewife and check out my guest post. A quick note, by the way...you'll notice my reference to the Patchwork, Please! Sew Along in the article mentioned above. I wrote this a few weeks back when the Zakka Along 2.0 was still going on, and as many of you know, it just came to a close. There's plenty of eye candy in the flickr group, though, so be sure to stop by for a visit. I had the absolute pleasure of sewing up a few samples for Quilt Market this week. The lovely people at Birch Fabrics sent me some of the new Charley Harper prints to make into a few bags for their display. I tackled a frame purse again to feature the beautiful Feeding Station print you see above. This type of bag is a lot of work but so worth the trouble. I used a variegated lavender Aurifil thread to stitch along the frame at the top, and I love the way it compliments the purple tones in the rest of the bag. Honestly, I can't say enough about these fabrics. They're absolutely stunning. The colors are so saturated, and the designs are just as you would expect from Birch -- incredible. All of the exteriors are made with canvas prints, while the interiors are cotton. I used my Nora Clutch Tutorial for the other two bags. This clutch is so quick to sew, and I love trying it out with different fabric combinations. 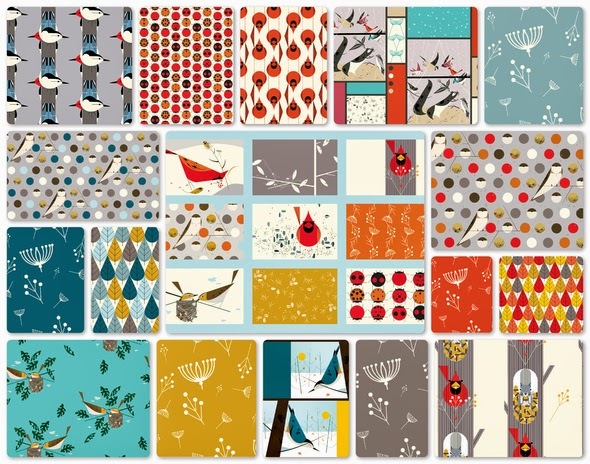 These Cardinal Stagger and Octoberama prints are just perfect for fall and winter projects. 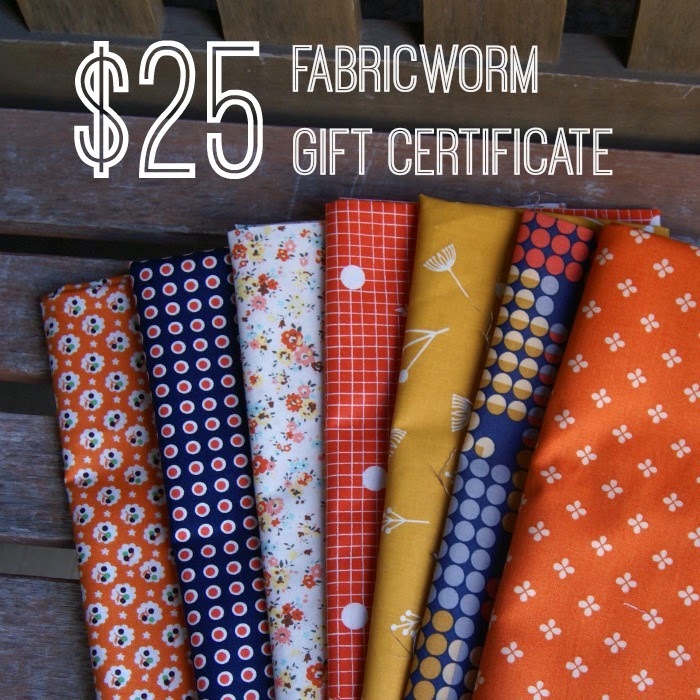 There was also a fat quarter bundle of Fort Firefly included in the package from Birch Fabrics which -- as some of you may have noticed if you follow me on Instagram -- is rapidly becoming a baby quilt for a friend of mine. I expect to have a finished project to show you in the next week so stay tuned! For ages now I've been longing to have a design wall of my own like so many bloggers use, but the wall space in my sewing area is simply nonexistent. Then I dropped into the local Home Goods store last weekend and found myself a beautiful compromise. This framed piece of burlap is supposed to be a creative take on a bulletin board, but it actually makes a fantastic miniature design wall for my workspace. It fits perfectly on my sideboard-turned-storage-table and is large enough to hold several quilt blocks and small projects at once. I love the way the burlap backing and fancy wooden frame give it extra personality. And once again I'm reminded that "challenge" is just another word for "opportunity." When my friend Erin asked me to join in her Strawberry Pincushion Swap, I just couldn't refuse. A simple little swap project? Check. Adorable fabric strawberries? Double check. I haven't had time to do a swap in a long time, but I just couldn't stay out of this one. I pulled some fun scraps together to make a little pouch for my swap partner, lining it with a sweet postage stamp print I found a while back. There was enough room inside for the strawberries and a few fun notions as well.